All Great Lakes water level is at or above normal for first time in 14 years | Watts Up With That? Remember this alarmist whining from Joe Romm’s Climate Progress last year? Great Lakes Michigan and Huron set a new record low water level for the month of December, and in the coming weeks they could experience their lowest water levels ever. 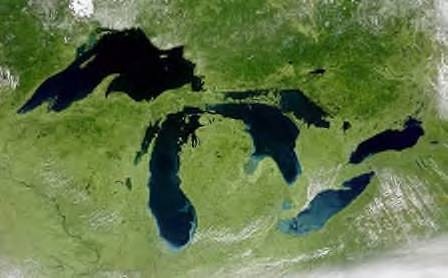 It’s becoming certain that, like the rest of the country, the Great Lakes are feeling the effects of climate change. Last year was officially the warmest year on record for the lower-48 states. The hot summer air has been causing the surface water of the Great Lakes to increase in temperature. One might think this causes more precipitation around the lakes, but the warmer winter air is causing a shorter duration of ice cover. In fact, the amount of ice covering the lakes has declined about 71 percent over the past 40 years. Last year, only 5 percent of the lakes froze over –- compared to 1979 when ice coverage was as much as 94 percent. 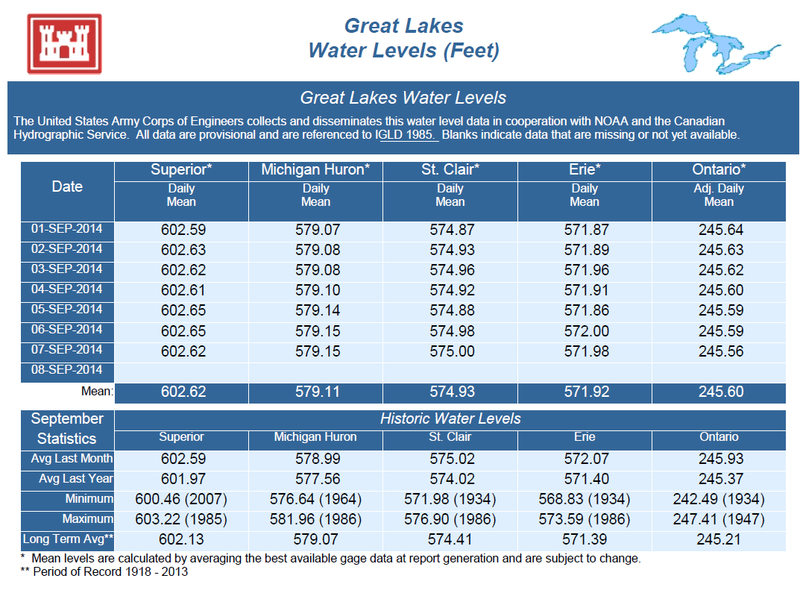 Current data from the U.S. Army Corps of Engineers shows that for the first time in 14 years, all five Great Lakes are at or above average water levels. Lake Michigan/Huron is up 18″ in the last year. Here is the last twenty years worth of data. The red line is the “normal” line in each lake level plot. The red dashed lines are forecasts. The last two years of relatively heavy winter and spring precipitation, however, have led to this year’s stronger-than-usual seasonal rise, according to Keith Kompoltowicz, chief of watershed hydrology for the Army Corps of Engineers Detroit District. So much for climate change effects, water is back to normal levels for now. September 9, 2014 in hydroclimatology. So you’re saying Joe Rome was wrong?!? No way! The bloke who fiddle whilst Romm burns? I just hate it when my computer thinks it knows more than me! Due to the wide bounds of natural variability, you cannot measure climatic shifts over a period as short as 30 years; it needs to be measured over several centuries, if not on a milenium time scale. As you increase the time over which you monitor natural variability the variability will only increase proving that climate is not just cyclical, it is always changing. Climate is a fractal distribution. The variability is scale independent. Unlike the “normal distribution” that is the basis of most statistical analysis, a fractal distribution does not follow the Law of Large Numbers. The average does not become more predictable over time, and thus the fascination of climate science with averages is meaningless. This is quite simple to demonstrate. Look at any graph of temperature. Regardless of the scale. 10 years or 10 million years, the “roughness” of the graph will appear unchanged. Contrast this with a coin toss, which does follow the “normal distribution”. Over time the coin toss will level out at 50-50 heads-tails, and the graph will become smoother as you increase the scale. Over time the average coin toss becomes predictable, while average climate does not. I do not agree here. If you flip a coin 10 times, you could get 8 heads and 2 tails, but over 1000 throws, you would not be anywhere near 800 heads and 200 tails. However that does not mean it is more predictable. Each toss still has a 50/50 chance to be either one and after 1000 tosses, the next 10 could still be 8 heads and 2 tails just as easily as the first time. Las Vegas would be broke if things were more predictable over time. Contrariwise. Las Vegas makes money because the probabilities in gambling follows the Law of Large Numbers and are therefore predictable. True enough. What I had in mind was that gamblers that blow thousands on a machine that is not lucky may wrongly “predict” that the luck has to change and keep losing more money on the same machine. I read of a person who actually wanted to sue a casino because his luck never changed all weekend and he blew tens of thousands. Hey ferdberple! Wow! Really great points about variability being scale independent! Let me interject just a small caveat though. The fractal nature of a pure mathematical system may be scale independent over all scales — but it is certainly possible for climate variability to be scale independent only over a more local region. In other words, the hausdorff dimension may be the same from 10 years to 10 million, but be smaller (or greater) on scales larger than 10 million. In the real world, I think you are completely correct about the scale invariance of climate variability over the span of time for which we have reasonable data, but longer term (a million years? ten? a billion? ten billion?) variability is more constrained that that of a strict fractal. There is no such thing as “average” climate. It is a meaningless term when talking about fractal distributions. Thus, the entire basis of Climate Science, the idea that climate can be characterized by “Anomalies” is false. You cannot characterize climate by how much it deviates from the mean, because the mean has no meaning. Dynamic systems are not like a coin toss or toss of the dice. They follow the power law distribution, not the normal distribution. OMG, ferdberple, you last two paragraphs says it all. This is and has been my thinking all along and I’m in no way a scientist, nor even that highly educated. Simple logic and many years of living tells me this. How many thousands of years have the Great Lakes existed? How can anyone claim any hieght records with so little data from such a short time? The lakes are about 10,000 years old. In the past 100 years drainage patterns and water use have also changed so these would have to be taken into account as well. Yes the lakes have existed for thousands of years. At least for Superior, I think the Locks & Dam at Sault Ste. Marie probably has added height to the lake average. Since each of the lakes have some man-controlled outlets, lake levels are not entirely due to nature. I before E except after c or as sounded as A as in neighbor or weigh. So height is spelled, oh never mind, you followed the rule. I before E except after c or as sounded as A as in neighbor or weigh. So height is spelled, oh never mind, you followed the rule? Another CAGW alarmist prediction bites the dust, or in the words of Gore, Mann, Romm, McKibben, and the rest of the indulgent bums, another inconvenient truth to ignore. 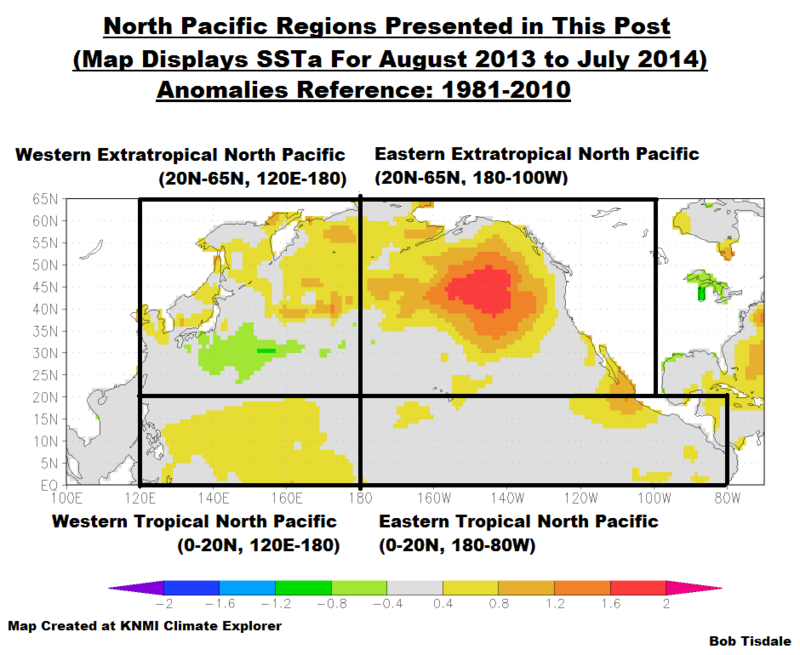 Have any CAGW Alarmist predictions been accurate? Well… they did predict that the investigation into Mann’s malfeasance would turn up nothing. Shockingly no. The odds are they should have gotten something right by chance. The guy who predicted that money would flow to this cause was pretty accurate. Off topic a bit, but does anyone know if it is unusual for Hudson Bay ice to persist thru a summer? Something is terribly wrong with the Lake Erie data; there’s not a spot on the bottom of this lake exceeding 210′ (on average). They’re talking about lake water level height above sea level, not depth. Lake levels are relative sea level. It makes it easy to work with topographic maps and to compare the various lakes. I think they are measuring the top of the lake in feet about sea level – not the depth of the lake itself. I knew it! I camped on the shore of Lake Michigan at Ludington this year and last, and I noticed much higher water this year, the beach was much less this year. Cold swim! In another 20,000 years, the great lakes will be holes in the ground. I think that was the estimate I saw of when Niagara falls will reach Lake Erie. And yes, that will be climate change’s fault as well. In 20,000 years the great lakes will most likely be under a few miles of ice in the next glaciation. Heh – I was going to say that the Niagra Falls power producers won’t permit the falls to erode that far, but your answer is much better. If the current trend holds up, it will be 20, not 20,000 years. Most of the geo-engineering projects that exist today involve controlling water. Think of dams, canals, levees, etc. One of the most fascinating, to me, is called the Old River Control Structure, which prevents the Mississippi from transferring its mouth some 60 miles to the west of New Orleans. It is a project of approximately the same size as would be needed to control the St. Lawrence. When Niagara Falls threatens Lake Erie you can be sure that there will be a massive engineering project to protect the upstream lakes, that is, providing that the nearby civilization at that time is roughly similar to what we have now. I wonder if Joe Romm will issue a statement on his horribly wrong predictions? I also wonder when the entire alarmist crowd will finally own up to the fact that nature is highly variable and mankind’s tiny impact is of little importance. If a windmill farm kills a hundred bald eagles, why does no one go to jail? I wonder if you will issue a correction about getting his name horribly wrong. Spell checker is a contemptible harlot. I will issue a correction and say his name is really “Joseph Romm”. but many others call him “Joe” so I really did not understand your comment. I think he was referring to Anthony’s original spell-check generated error: Joe Rome, which he subsequently corrected after someone informed him of it. Well, we would have all crops on the planet growing about 20 to 25 % more food then now, on the same amount of water we currently use. What a catastrophe!. Because wind farm owners and supporters enjoy a very undeserved special political favoritism with Obama and the federal government right now. No other sector of the energy industry is allowed this privilege; politicians and govt bureaucrats are allowed to foster this hypocrisy and double standard, and not enough people care for anything to be done about it. I guess as long as you claim to be “green”, you’re entitled to be hypocritical, lying, and manifest any other vices you care to think of. Like ignoring the recovery of water levels on the Great Lakes, factual evidence, logic and reasoning just don’t register with the green left and climate alarmist camps these days–if they ever did. Makes one wonder how high water levels would be absent this artificial influence. There has always been natural outflow through the St. Clair river. The average outflow from the river in 1965 was 16,500 cubic feet/sec, in 1976 it was 21,000 cubic feet/sec and was back down to 17,500 cubic feet/sec in 2010. The rate of outflow is a function of the lake levels which follow a 120-200 year long term cycle and a shorter term cycle of 29-38 years. The reversal of the Chicago River and Calumet rivers were the largest artificial diversions of water out of the great lakes. The Chicago River flow is 3200 cubic feet/sec but because the locks leak so badly that flow is closer to 3500 cubic feet/sec a violation of the treaty with Canada. Thanks for posting “the drain.” Why blame dredging a channel when you can blame “Climate Change.” That Lana Pollack is a piece of work. She fears the project will detract the public’s attention from what she sees as the real issue — climate change causing increased evaporation. Her husband is Henry Pollack, a University of Michigan scientist and member of the team of climate researchers who shared a 2007 Nobel Prize with former Vice President Al Gore. There are four competing interests when you discuss Great Lakes water levels. One is the shipping companies which desire lake levels as high as possible so they can load their ships with more cargo to lower costs. A higher lake level allows them to get the ships into shallow harbors. The second is land owners/communities who either enjoy the lake when it is low by extending their property farther in front of them, complain that they cannot access the water too far from their dock or complain that high water is taking away their shorefron due to erosion. The third are towns with harbors/marinas that want high water to facilitate shipping as well as recreational boating and finally there are environmentalist that are all over the issue. Some prefer low water to restore marshes/sand dunes or high water to provide spring breeding for native fishes. It was projected to cost Chicagoans billions to extend Lake Shore to protect beach front condo/appartment buildings from getting washed into the lake. The normal lake michigan lake level is about 581 feet and people complain loudly at the record low of 578 feet and the record high of 581 feet. That’s a variation of about .5% over the last 100 years. Considering the rate californians are draining their reserviors we really have to consider ourselves lucky they were unable to tap the great lakes as they desired. record high of about 584 feet rather. Anthony – the Chicago Tribune article is quoted in its entirety TWICE above… edit? There’s this strange glitch in wordpress that occasionally causes this when pasting in external text. A moderator fixed it for me overnight. So my old neighbors, fishermen, are correct, observing that this rock or that rock and that wreckage is low in the water. We live in interesting times. I usually eye ball the water level in Lake Superior relative to a certain boat launch ramp. The level varies season by season and year by year just like it always has. Superior is the largest of the Great Lakes by a wide margin. It holds 10% of the surface fresh water on the planet, enough water to refill all the other lakes combined with a couple of Lake Erie’s to spare. Lowest water level ever recorded on Superior was in 1926. If you’d care to drive around it the round trip is 1200 miles long. In the summer of ’65 Lake Huron was 4 ft below normal and it was talked about as a permanent catastrophe. Given the CO2 output by mankind since then I can only conclude that raising the CO2 concentration increases the total rainfall in the watershed of the upper Great Lakes. Lake Baikal in Siberia holds 20% of all the planet’s fresh water, twice as much as Lake Superior. I believe that Pablo was referring to Superior being larger than all the other Great Lakes combined, not stating that it was the largest single lake in the world. Steve R: As you can see from the link below, Hudson Bay Ice normally goes to 0 sometime in September. Pretty far off topic I’m afraid. 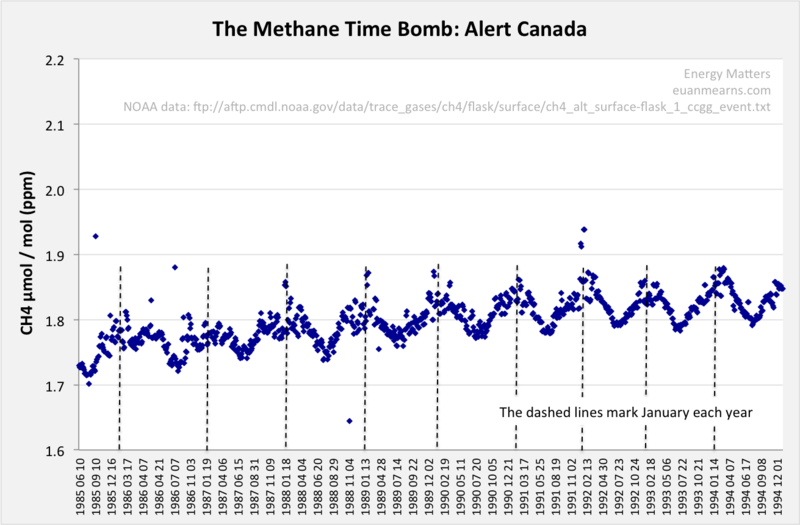 I don’t know if it is common knowledge, it was a surprise for me, but the peaks in Arctic methane occur in January each year. Kind of hard to reconcile with melting clathrates. Front running theory at present is optical destruction of CH4 in summer. We have the reverse trend in SH. The main point is that there is no evidence for clathrate melt in the summer months. euanmearns, optical destruction? Really? More and more interesting… If that is true, then the half life of CH4 must be pretty darn short. It will be hard to make a crisis out of a GHG that falls apart too quickly — unless they just fudge the numbers like they did for CO2 half life. From the U.S. Army Corps of Engineers records, the Michigan/Huron extremes are 576.64 (1964) and 581.96 (1986). I wonder where the Tribune got their data. It’s a bit curious that one figure has three significant figures and the other has 4, but that could be from an editor not realizing the “.0” in 576.0 contains “significant” information. OTOH, they may have have picked that from two different sources, though it’s hard to believe one has a one foot resolution. We’re not talking ocean-scale effects here! The lake ice cover was exceptionally wide spread last winter. It was thick too requiring the use of ice breakers well into the “normal” shipping season. Had an opportunity to see for myself how ice clogged the Makinac Straights was in mid April on a flight back from Europe. Wall to wall ice with freighters following an ice breaker through a single channel. On Lake Michigan, same flight, the ice extent went down as far as Door County on the West side and much further down on the East where the prevailing winds were heaping it up close to the shoreline. Quite a sight to behold. Lake Superior still had ice fragments floating around on July 4th. Every year the ice extent extends as far down to Door County. That is why Washington Island is serviced by an icebreaking Ferry Boat during the winter and has been since the 1950’s. Prior to that, the mail and supplies were brought over the solid ice in trucks with tracks on the back and skis on the front. No doubt the activities of man have lowered the levels of Lake Michigan and Lake Huron, but Catastrophic Anthropogenic Climate Change is not the reason. From a 1982 NOAA document, the dredging of the St. Clair channel noted to have lowered lake levels. Sounds like we need to homogenize the data. It will just be a matter of time when NOAA will tell us they have taken that into consideration, apply a computerized specialized handy dandy al’gore-ithm and prove once again we are all going to die of something. If the dredging which started in 1908 is responsible for lowering lake levels, how is it possible that after of 106 years of accelerated outflow that all of the Great Lakes are at or above their normal water levels? Based on your comment, after 106 years the total effect of the dredging was 10.5″ of lost lake level or about 1/10th of an inch per year. Its amazing you trust the St.Clair dynamic flow “model” to be able to discern such a small “signal” amongst all the weather related noise that could explain changes in lake levels. The great lakes have a decadal cycle – 30-40 years. You can go back to newspaper archives to find shoreline flooding or back yards adding 100 feet. By the way, beautiful part of the country. I was there last early Spring when the crushing, creeping, crackling sea ice was blown ashore and started eating condominium doors, siding, and picture windows. I was also amazed at how large the corn-fed deer were. Much larger than our forest deer in NE Oregon. It was Spring of 2013. We walked on top of its sometimes slick sometimes jagged surface as it slowly made its way to the houses. Amazing. And there was no stopping it. It would have been able to move a dump truck. Yep, White tails grow to a pretty good size in the corn belt and in PA and parts of NY also. So much the better to trash your car. It is a very good thing to pay attention to when the Rut starts in these parts because the deer start acting dumber than usual. Drive looking as far ahead as you can. Last fall I was driving west along I-86 in the lower tier in NY through the early morning hours. I just knew I was going to have to watch it. Sure enough toward the beginning morning nautical twilight (BMNT) I caught movement to the right side of the road up ahead. Foot covering the brake, I watched a big ole buck, couldn’t count the points but he had a good rack, just trot right across with his nose up in the air hot on a scent like my rig wasn’t even there about 75 yards ahead of me. A quick jab of the breaks and I knew I had missed him. .Now if that had been a doe I would have been really on the brakes because they come in pairs or more one behind the other usually. Of course I could just be paranoid since I hit Cow Elk on I-40 in Arizona one very early morning. I parted the hair on the nose of an elk with my side view mirror once high up in the Blue Mountains in Oregon. It’s head was taller than the top of my jeep. You hit one of those things and your car looks like an accordion from then on. Like straightening the waves on tin roofing panels. Can’t be done. Just to put a number on the increased ice coverage: Great Lakes ice cover was 92.2%, putting winter 2014 into 2nd place in the record books. I wonder if there will be a year in my lifetime (another thirty years, max) during which the ice will not completely melt in one or more of the Great Lakes? Does anyone know the approximate date of the last ice to melt? Yep, that’s five healthy Canary’s merrily chirping away. I am concerned about the amount of water pulled from the aquifers, used in homes and businesses and then sent down the Mississippi River to the Gulf of Mexico from sewage treatment plants. The Mississippi watershed starts only about 20 miles west of Lake Michigan, meaning that lots of water gets pulled from the ground and sent away from the Great Lakes. That is a man made effect of development decisions unrelated to climate change. The water needs to be returned to the source by recharging the aquifers. Nature has compensated for now, but who knows if the water level would not be at a high right now absent the effect of private and municipal wells? You are right to be concerned about water pulled from aquifers…….around the world. The Ogallala Aquifer, which has been getting drained like there is no tomorrow, is finally having some conservation/management applied. The future in the Plains and other drought prone regions with depleted aquifer water supplies is looking rocky (dusty) at times. It isn’t a matter of if there will be another great drought(the Dust Bowl decade of the 1930’s was less than a century ago) but when. Interesting that one of the benefits that increasing CO2 imparts on plants, is that at higher levels of CO2, plants can adapt to droughts better, with improved water efficiency. Higher levels of CO2 assist plants, allowing them to adapt to naturally occurring droughts. With regards to the droughts caused by humans burning fossil fuels, the increasing CO2 is of no benefit to plants. Those kinds of droughts, mainly existing on paper/computers from climate models, coexist with similarly derived models that show increasing CO2 having deleterious effects on plants/crops. The USDA will be updating their demand/supply report for US and World production numbers for crops this Thursday. Look for them to increase their crop estimates for this years record large corn and soybean production. Almost ideal weather(a bit dry but very cool in July) and the addition of more atmospheric fertilizer have been 2 big positive factors. Though right now things are looking pretty good for the corn and soya bean crops we aren’t out of the woods yet. Though I have seen no figures I suspect that the tomato crop here in central Indiana took somewhat of a hit this year. The harvest is on and it sure seems there are fewer trucks than last year. I’ll be Red Gold did not have a great season. In the gardens, where they get plenty of water, still a whole lot of green tomatoes on the vine when usually they are pretty well done by this time of year. Lack of hot days I guess. If you talk to people who drill wells around wisconsin and northern illinois they will tell you that the water that gets pulled up from those wells comes down through the rock from Canada. so draining wells in Wisconsin and Illinois has nothing to do with Great Lakes Water levels. A few years ago, mid July when Lake Superior was at its low mark, my dad took a trip to the cabin and was stunned to see that the top half of a large maple tree out front, which is just 50 feet form the lake, had dropped all its leaves. The dropping water level must have lowered the water table to below the root system. He had to pump water to that tree to save it. I found it strange that just a couple foot level drop could cause that. I’m sure the local vegetation welcomes the higher water levels, and so do the mosquitoes. There is a seaport at Churchill and the first grain ship departed for Mexico on August 5th, which is normal. It usually stays open into November. They have records going back to 1600. If it’s above normal it must be caused by global warming. Yes but if it’s below normal it must be caused by global warming too. Yes, I know it’s not obvious. You have to go through 7 years of daily indoctriation to just begin to grasp how climate really works. During the “Chippewa Phase” of ancestral Lake Michigan 10,000 years ago the lake level was 100 feet lower that it is today. During a cooling period (6-10,000 years ago) known as the Hypsithermal the lake levels reached 20 feet higher than today about 5500 years ago In between glacial periods there does seem to be a cycle of about 60 years where lake levels hit a low, then surge to highs 30 years later then back down again. “Hypsithermal” means “warmer (than today)” and is a name for the climatic optimum during the early-mid Holocene. And, yes, it was also wetter than at present. Warm intervals ar normally wet and cold intervals are dry.
. Fat tails indicate a power law pattern and interdependence. The “tails” of a power-law curve — the regions to either side that correspond to large fluctuations — fall off very slowly in comparison with those of the bell curve (Buchanan, 2004). The normal distribution is therefore an inadequate mode l for extreme departures from the mean. This water levels look similar Artic ice coverage. I’ll have to plot the together: notable decline since 1997, low in 2007, 2012; climbing last two years. 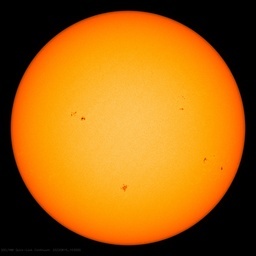 Are you sure we’re not moving into global cooling? The Detroit News also had a good report on rising lake levels, and I can tell you that it is much easier to get in and out of my boat this year than last. I have tried to convince the editor of the Detroit News to interview all the shaman who were proclaiming that the lake levels were in permanent decline due to climate change. Unfortunately, I have not had much success, but I will keep trying. If these are heights above sea level have they accounted for sea level rise??? That would give the false impression of 3mm/yr drop in lake levels even if they had the same water in them. I’m sure the reference is to some well-surveyed benchmark that is traceable to some sea-level benchmark from a long time ago. Anthony, unless there some subtle difference I’m missing, it seems you posted the Tribune quotation twice. There be “ice” on the Glacier Park, “Goat Haunt” web cam lens. Just weather, but cold weather. I once read a report from NOAA that natural rising of the land under the great lakes would cause them to lose depth and virtually become dry lake beds in the distant future. Therefore, climate change matters not base on that assumption. Not exactly become dry lake beds, since the land around the lakes is also rising at approximately the same rate. What will happen is that the lakes will be “tipped over” towards the south since the land is rising faster towards the north (where the ice was thicker and melted later), so the northern shores will rise and the southern sink. Tough luck for Chicago. This phenomenon is quite noticeable for large lakes in Scandinavia where the postglacial rebound is still quite large. Believe it or not, there is even a special word for it in Swedish “sjööverstjälpning”. It is even conceivable that the lakes will start draining into the Mississippi system again, if the interglacial lasts long enough. Global Warming means never having to say you’re wrong. Its like someone cleaned the lens at Goat Haunt, now no ice at all. Thanks National Park Service Rangers I guess. I can’t fathom how much water it would take to raise the great lakes a foot and a half….. If one rain in Australia can be blamed for sea levels falling…..
With the late ice this year, are the lakes also the coldest in many years? See the map provided by Bob Tisdale – Figure 6, right side, in green. Thank you! So they are about a degree cooler than normal. It does not sound like much, but for all that water, it is an awful lot of joules. Sorry, I thought the /s tag would have made it obvious that I was being sarcastic. I’ll avoid using the word deniers even in a sarcastic sense. Great Lakes rising, soon to submerge Toronto, Buffalo.. Chicago is doomed..
At what point do we stop laughing and make ready with the tar and feathers? The costs of this mass hysteria have been brutal. My humour toward these shamen is becoming the same. Oh no, it’s worse than we thought. We’re doomed! I’m a bit surprised someone has not blamed catastrophic Republican-caused climate change for diverting California’s rain to the Great Lakes. Sometimes these climate nutters are a bitter disappointment. My models show that the water level rise in the Great Lakes is caused by catastrophic thermal expansion of the water therein. I think we’re found the missing heat! And we’re all going to die if we don’t build more windmills. Breaking News: Franklin expedition found. Michigan inland lake levels have rebounded very nicely due to our 2013/14 mega winter and copious rains last fall. Summer rains have mostly replaced all water lost to this summer’s solar evaporation too. So, this is magnitudes more water than they claimed in the Australia floods…. Does anyone know if they are showing it as saw levels falling again?….or is it crickets? We were told in 2013 that the Great Lakes were at a historic low water level condition. One short year later, their water levels have all recovered to ‘normal’ levels, thanks to plentiful precipitation and an extended seasonal ice coverage. This illustrates dramatically how wide the natural variability of the Great Lakes water levels really is…. and the utter folly of trying to link changes in their seasonal/annual water levels to minor changes in atmospheric trace gases. Family members and friends that reside in Wisconsin were far more concerned about the scarcity and high costs of propane for heating in the record setting cold of last winter (54 days below 0F) and the increasingly unreliable electrical grid than any laughable ‘warming’ effects from 0.04% by volume atmospheric CO2. I would like to point out that there is no “normal” level for the Great Lakes it is actually the average this seems to be a small mistake with the topic that should be corrected. With the almost absolute ice cover and the long, slow thaw, the lake was VERY cold this summer. Water sports on the lake were rather unpleasant, and probably dangerous (hypothermia risk). The temperature stayed so mild that we barely got into the 80’s much less the 90’s, and “cooler near the lake.” The beach was kind of chilly in a swimsuit, and you really couldn’t stay in the water at all safely. Only 2 days above 90 degrees all summer. Unusual but pleasant. Lake levels have been up or down 4-6 feet at various times over the last 20 years, and I tend to ignore it, as it is always changing. I am more concerned about invasive species and the health of the fish population. Let’s spend some environmental money on those problems. Lakes have levels. One lake has a level, or so it would seem. Plus the water levels belong to the Great Lakes, no? No need to keep this post in the comments. Okay to delete it after consideration by the Mods. Keep up the great work and excellent articles. Your articles are used by many people, to help to counter the unsupported climate hysteria in the media. 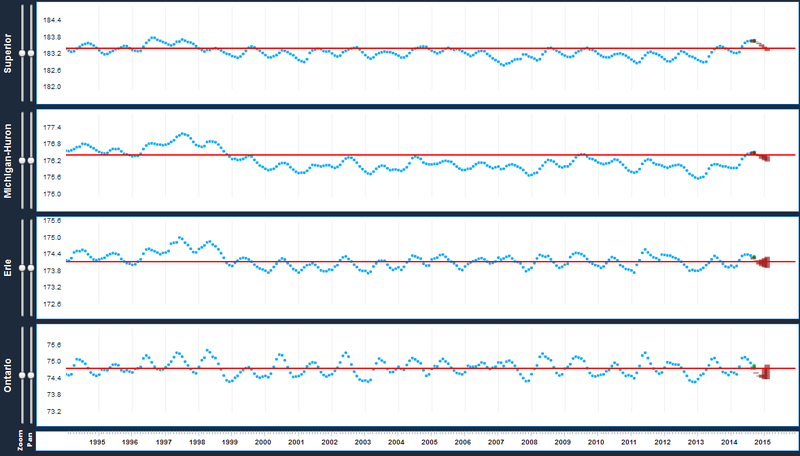 http://iceweb1.cis.ec.gc.ca/Prod20/page3.xhtml – ice went from all time minimum for season in the record back to 1980 to all time maximum in 2013/14. Every week was above normal http://iceweb1.cis.ec.gc.ca/Prod20/page3.xhtml – with the ice seen still in June on Superior. Does anyone know what happened to all the federally funded Great Lakes “emergency dredging” projects scheduled for 2014? Did they just go ahead and dredge anyways, even when “emergency erosion control” projects are now more appropriate? If so, it would make a wonderful example of how “we have to do something before it is too late” global warming monies are wasted. In regard to the EPA and Corps proposed Waters of the USA Rule and the potential regulatory reach into every nook and ditch in the country…. So if “Climate change is lowering Great Lakes water levels” is climate change also increasing Great Lakes water levels? Climate change also lead to the late ice on the lakes this year. Is there anything climate change (or co2) cannot do? Climate change is lowering Great Lakes water levels. ….It’s no secret that, partially due to climate change, the water levels in the Great Lakes are getting very low…..
representing a sizable range of about 6 feet. Well, maybe not. I went to school in Valparaiso Indiana and learned first hand from the seat of my bicycle what a glacial moraine looks like; it’s very hilly. There is a spot between Chesterton and La Porte where Interstate 80 cuts right through the folded landscape that marks the southern terminus of the Wisconsin Glacier. When the glacier melted, it left behind the monster lake Algonquin that drained down to the level of the Great Lakes that we see today. After school, I learned that I actually had some skill at riding and racing bicycles. Our team training rides have taken us all over southern Wisconsin, northeastern Illinois, and northwestern Indiana, generally following the margins of the moraine, as that is where the most low-traffic bicycle-friendly roads are, and the hilly terrain is good for training. The better rides push 100 miles in length, and after long hours in the saddle you start to notice things – things like piles of sand and rocks and shells that look just like a lake beach in places like the Palos Heights bike trail in Illinois and alongside the country roads around Dyer, Chesterton, and just north of La Porte in Indiana. Lake Michigan is a good 20 miles north of these locations today. My Garmin 705 GPS records elevations around 650 ft above sea level when we ride down at Palos, and the current lake level is about 579 ft, so I would say that Lake Michigan has dropped at least 60 or 70 ft since the climate started to warm up at the beginning of the Holocene. I for one am OK with that. As a matter of fact, I want it warmer today, as we just delayed our scheduled 70 mile ride this morning due to the 39F forecast starting temperature, as most of us have yet to dig our winter gear out of our closets and our bodies are still acclimated to summer temperatures and humidity. Cyclocross season doesn’t start for another week, but it already feels like mid November. Argh. Well, if anybody is in the Chicagoland area, September 28th is the Apple Cider Century in Three Oaks Michigan, and the 100 mile route traditionally includes a stretch along the current Lake Michigan shoreline just north of New Buffalo. The elevation is 692 ft at Three Oaks, so the ride will cross the former shoreline of Lake Algonquin and the second shoreline of the successively smaller Lake Chicago that followed, to reach the modern shore of Lake Michigan. If you pay attention, you might even see the former beaches along the way. So, can we now say, “Move along; nothing to see here.”? This brings up something about the polar ice area. When it comes back up to “average”, then it is as if the “record low” never existed. For the physical real world it is a clean slate. And, being a clean slate, the physical real world future is virginal territory. It might go up, and it might go down – and it certainly will do both. Get with the program! If the levels are lower it’s proof of global warming; if they are hgigher, also the same. Gosh..must I teach you everything?